The Flash capture software provides three ways which can capture all the SWF you watched: saving Flash SWF from browser cache, searching SWF from local files and spying SWF in current process. Saving Flash SWF from browser cacheâ€”Sothink SWF Catcher lists all the SWF files browser cache; IE, Firefox and Chrome are supported. Instead of remembering website URL, you just need one click to view SWF since the Flash capture software follows your path to keep track of favorite SWF automatically. Searching SWF from local filesâ€”Sothink SWF Catcher scans SWF from local machine, including AIR, APK, Flash EXE and SWC; no Flash could get hidden from your eyes. Spying SWF in current processâ€”it also runs auto detection in any of your current process after clicking Process Capture Button. Any SWF in the current process will be listed; you can save the desired one after preview. The three ways can help users to find almost all the SWF files as needed. The Flash capture software can be applied in different fields like animation, banner, advertisement, game, interaction and etc. So Sothink SWF Catcher is an advanced Flash assistant tool for professionals. It brings great help in Flash website design, 3D Max animation development, Flash ad design, website game design, Flash banner design, Flash teaching and etc. To sum up, where there is a SWF file, there is a Sothink SWF Catcher. It catches all the SWF files for you. You can put the SWF to other use like study, analysis, design and teaching. So Sothink SWF Catcher is a must-have tool in Flash relating works. You are welcome to download Sothink SWF Catcher. 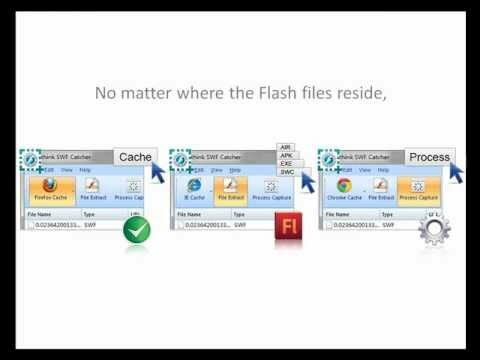 More info about the Flash saver. This entry was posted in Sothink SWF Catcher and tagged catch swf, flash capture, flash capture software, flash saver, swf saver by benny. Bookmark the permalink.